Not one to be left out of a major graphics card launch, MSI has also announced a line of GeForce GTX 1070 Ti series graphics cards. 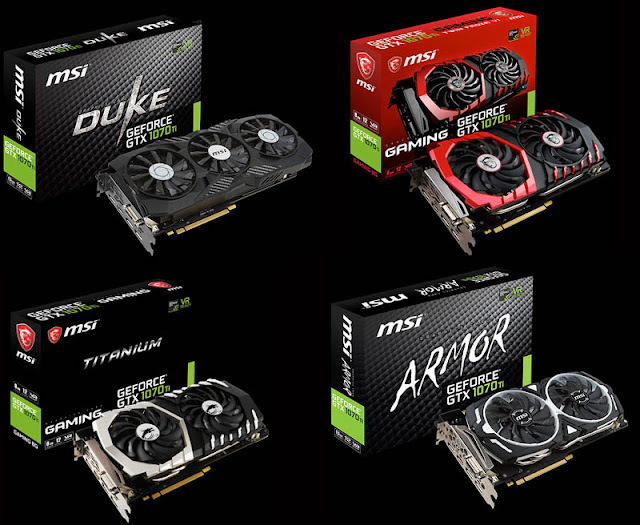 Given the fact that Nvidia has restricted manufacturers from churning out factory overclocked video cards, the base / boost clocks on all the graphics card listed here are limited to 1,607MHz / 1,683MHz. All five cards are equipped with 8GB GDDR5X memory running at 8Gbps, sport a single Dual Link DVI-D, one HDMI 2.0b, three DisplayPort 1.4 ports and require at least a 500W power supply.